The sun and wind are always beating down on surfers somewhere in the world as they paddle out to catch the waves. Defeat the elements and the strain of paddling with the PaddleAir Ergo Sun Hoodie. We introduced the Ergo Sun Hoodie last Spring (get the details here) and the positive response from surfers has been fantastic. 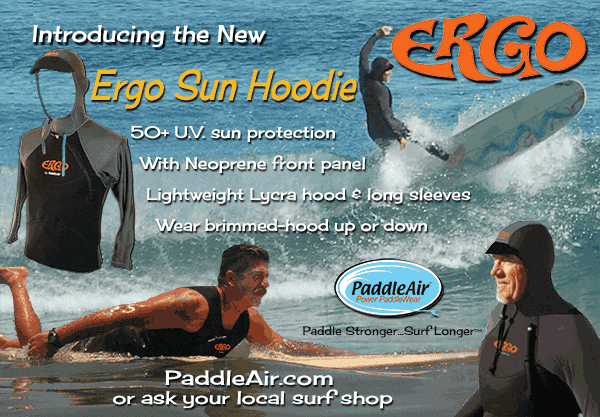 If your concerned about the effects of sun and wind on your body as you surf, the Ergo Sun Hoodie is a must. And, as with all Ergos, the Sun Hoodie features the patented PaddleAir adjustable lift to allow you to paddle stronger so that you can surf longer! Get it at PaddleAir.com.